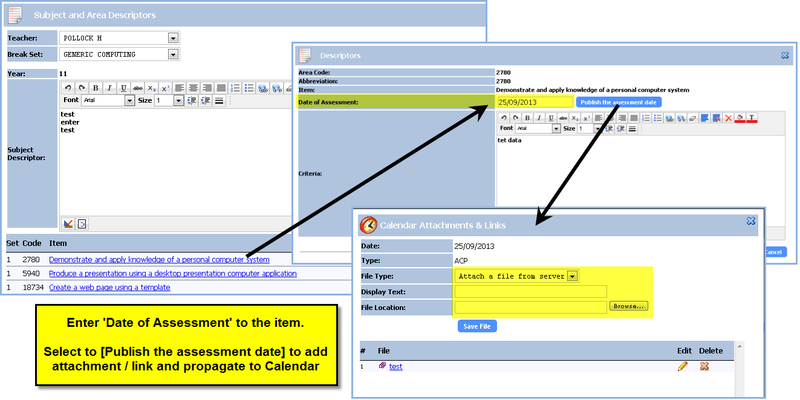 PCSchool has made further enhancements to the Subject and Assessment Criteria control, now linking it to the Calendar. Due dates for assessment items can be entered in via the Subject and Assessment Criteria control with the ability to also add attachments (either files or hyperlinks). These dates are then propagated to the Calendar within Spider and visible to to students, caregivers and teachers that have that subject attached to them in the timetable or for assessment. This entry was posted in Assessment, Calendar, Curriculum, Spider, Subjects and tagged assessment, Classroom Management, curriculum, pcschool, school administration software, School Administration System, School Management Software, School Management System, school software, Student Information System, student management Software, Student Management System, Subject Information, web spider by studentmanagementsoftware. Bookmark the permalink.